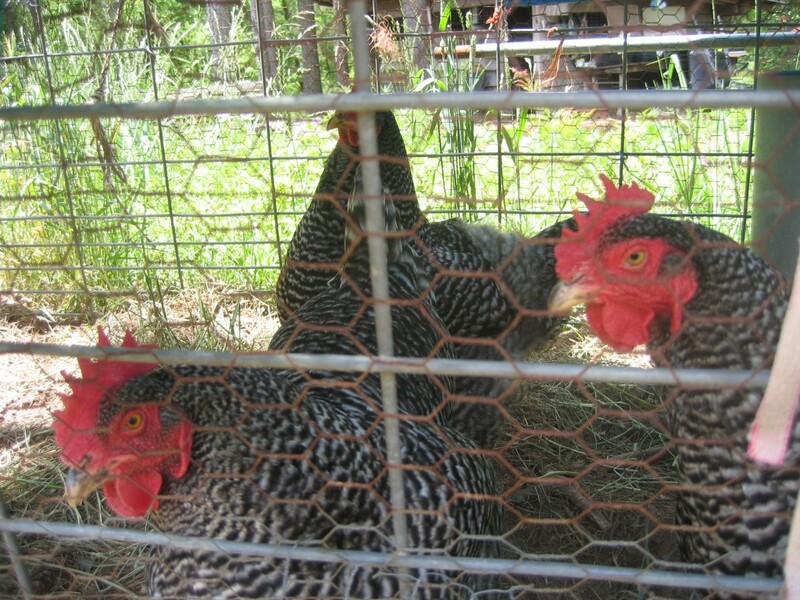 Welcome to Round River Farms! 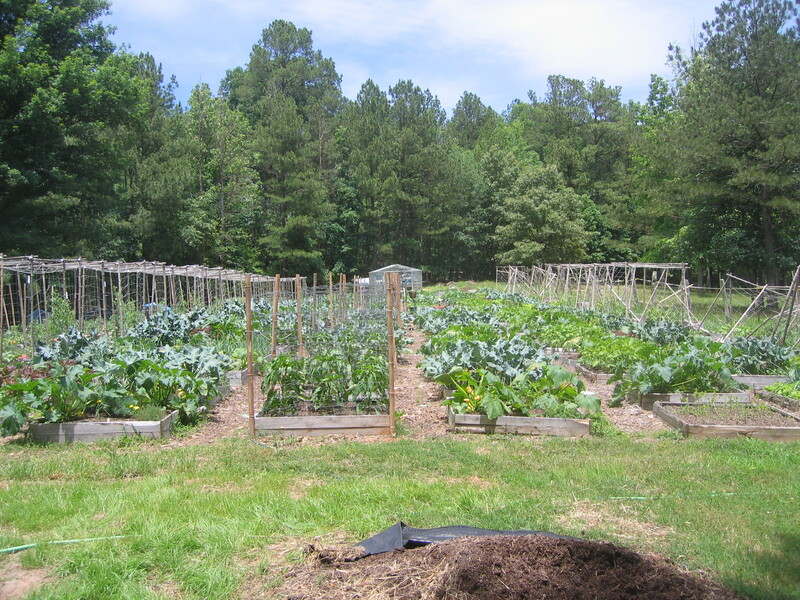 The garden is built on the “square-foot” system. Each box has several different vegetables growing in it. In the back, near the middle, is the greenhouse where all the seedlings were born. One of my first jobs is to fix the broken trellises on the right. 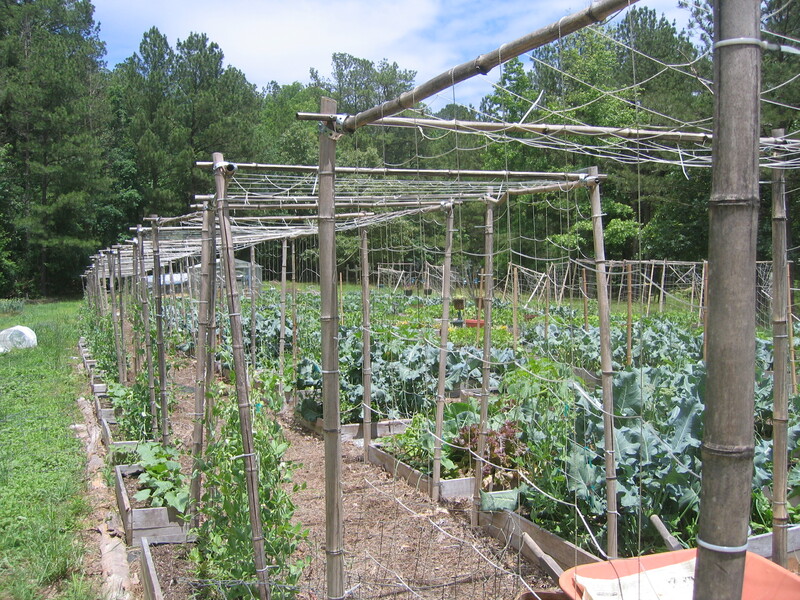 This is what the trellises are supposed to look like. They’re made out of bamboo. Eventually, when the peas and tomatoes have climbed up them, I think they’ll make a really cool tunnel – perfect for a romantic interlude. 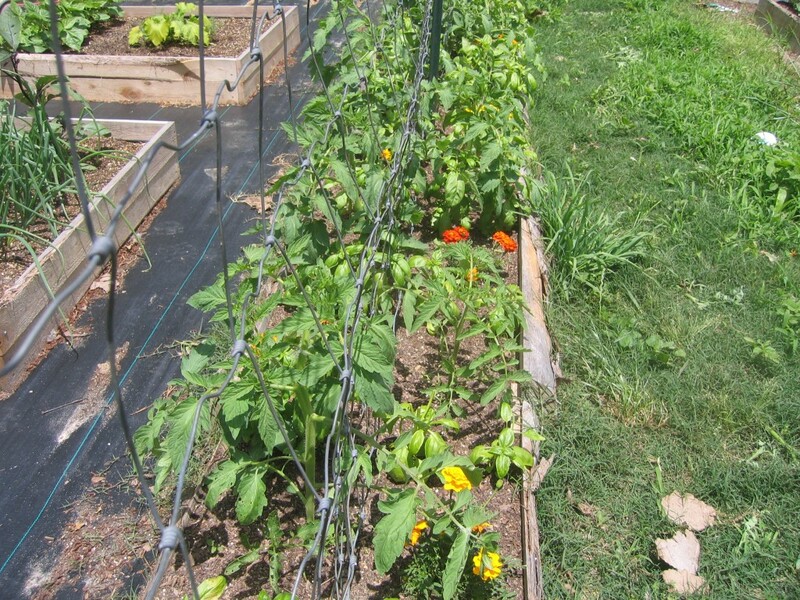 A typical garden box- tomato plants, basil, and marigolds. We also are growing squash, cucumber, eggplant, lettuces, dill, sage, lemon balm, onions, soybeans, collards, potatoes, and probably some other vegetables I forgot. 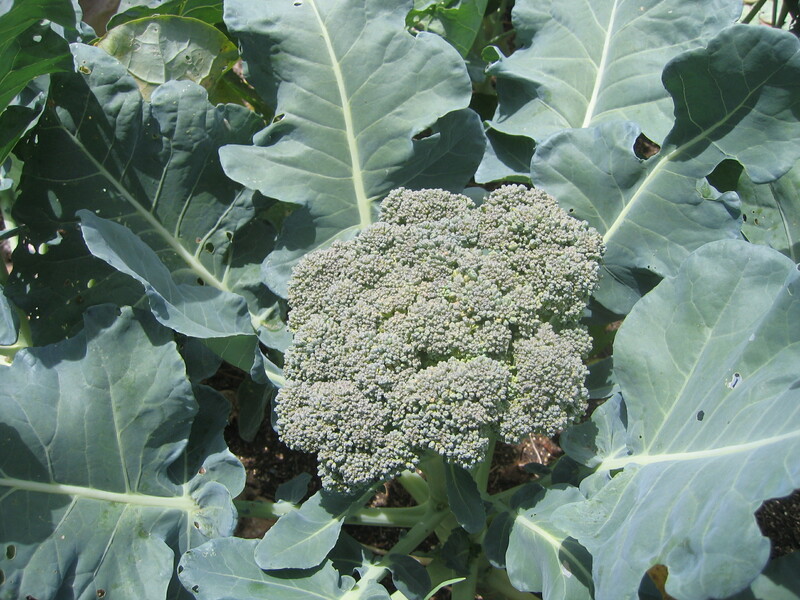 This is some broccoli I planted several months during my interview. It’s proof that I must have at least a little green thumb in my blood. 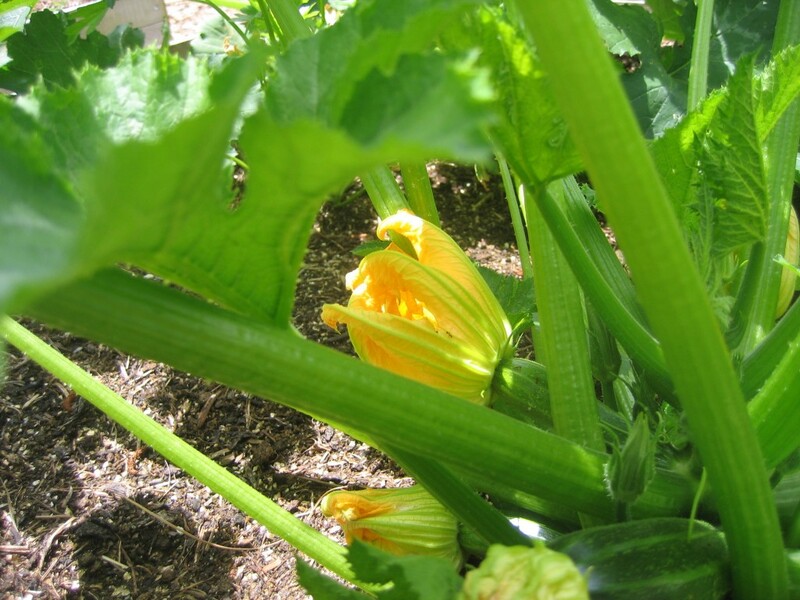 A squash blossom. At the bottom you can see the blossom growing into a cucumber. 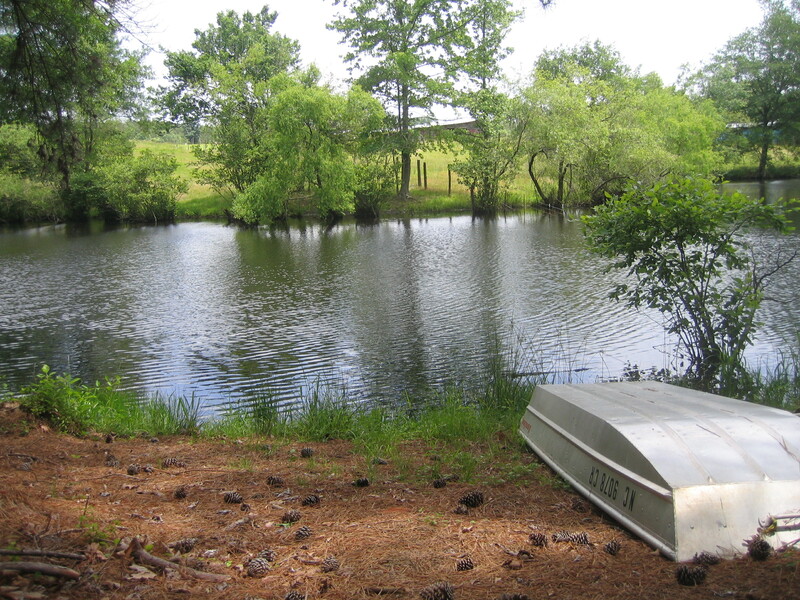 The pond across from the garden. Very Zennish, isn’t it? I’ve always loved home-canned goods. When I was growing up, my mom stacked shelves full of them in the basement. Whenever I had to go down there, I would stop for a few moments and gaze at the sunset colored wall – the dusky yellow corn next to the subdued green beans, burnished orange carrots, and the mottled red salsas. My favorite was the jams. In the murky light of the basement, they glowed like buried treasure. This was my first time making jam. I expected it to be much harder, or at least more sweat inducing, than it actually was. That’s the great thing about freezer jam. 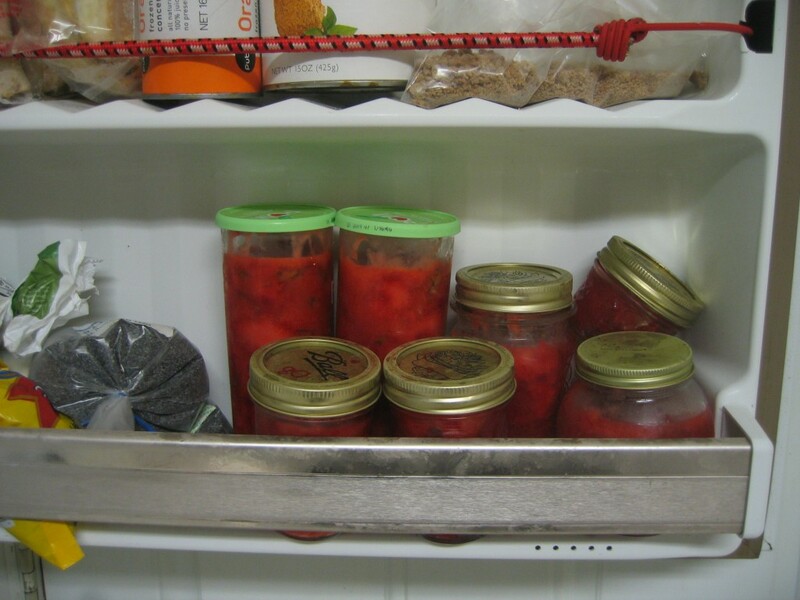 Because it is preserved in the freezer, there’s no fuss with water baths and sealing jar lids. Just smoosh the berries (which is a very rewarding activity in itself), boil water with the pectin, then mix them together and freeze. How easy is that? Too easy. With my first batch successfully setting on the counter, you’d think I’d be content for the day and go to bed. But no. There is a greed that befalls jam-jewel makers – well, this one at least. I couldn’t stop thinking of all the little extras I could add to my jam. 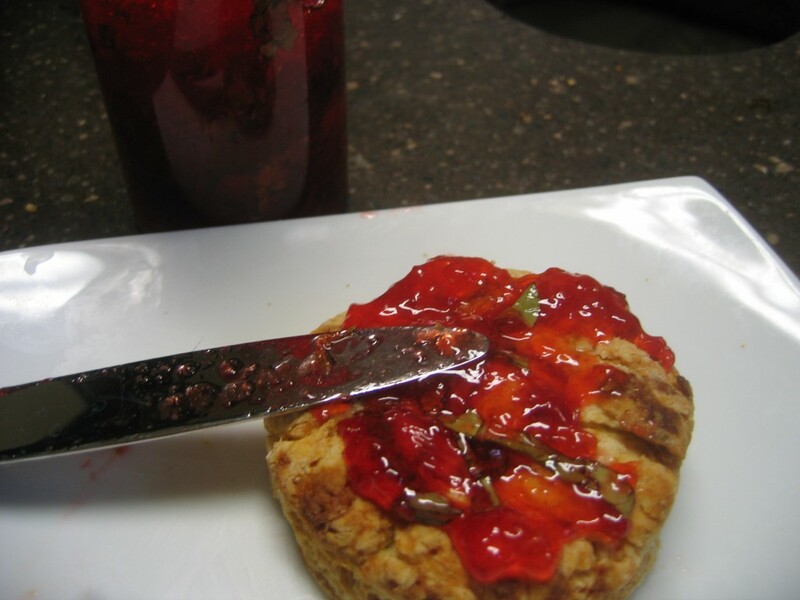 Think of all the things strawberries pair well with and then imagine that in a jam. Strawberries with rhubarb. Strawberries with cinnamon. Strawberries with coconut. Strawberries with lime. 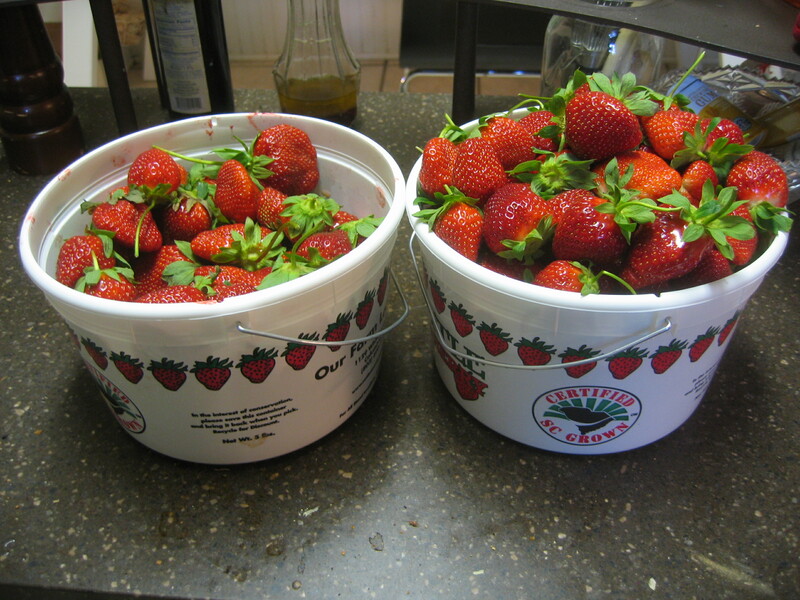 All’s I can say is, it’s a good thing I didn’t pick that many strawberries, or else I’d have a freezer full of just jam right now. In the end, I decided on a strawberry basil jam. I’d first tried this combination last summer in a strawberry watermelon basil salad that was refreshing but not overpowering. The basil added a slightly savory element to the otherwise sweet salad. I hoped the same would be true of my sugar laden jam. Due to the chopping method (chiffonade) the basil comes out in long green ribbons that twirl through the red jam like streamers, which I love. Someday, when I’m lucky enough to have unlimited freezer space, I’d still like to try some of the other flavor combinations I mentioned. Especially the strawberry lime. In an effort to reduce the effect of the green eyed jam monster, I’ve decided in advance what flavor combinations I’d like to try in my other jams: cinnamon peach, apricot amaretto, and cherry balsamic. Canning is a hopeful venture. Stirring a bowl of simmering fruit links me with all the cooks of times past who poured their hope for the future into jars. Like the ant in Aesop’s fable, they prepared for the winter while the hot sun still shone on their shoulders. The winter filled them with neither dread nor lassitude. 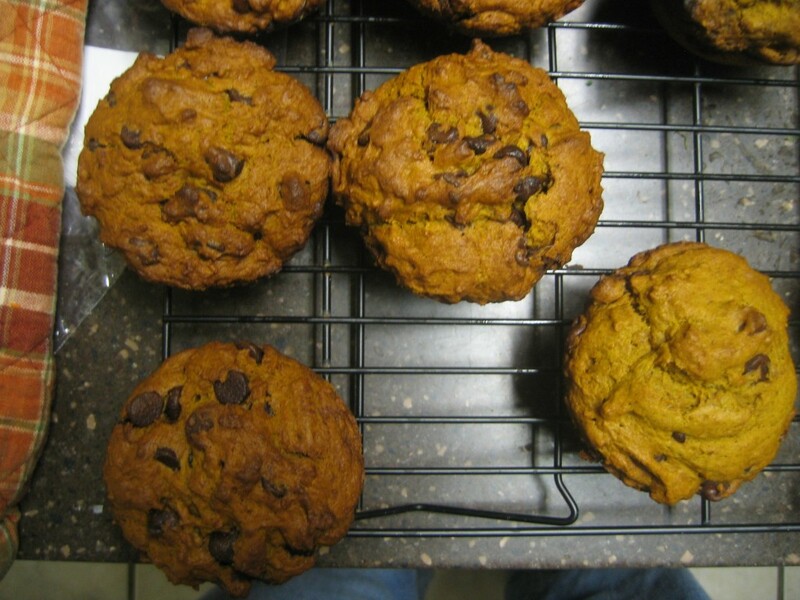 In the winter, they could provide abundantly for their family as well as unexpected guests. They could look at a sky pregnant with snow and not despair. 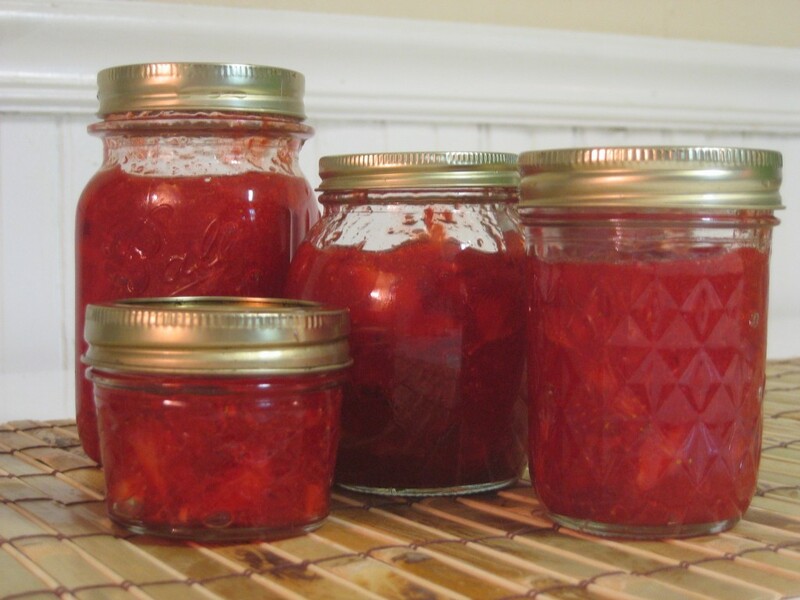 While for me canning is less of a necessity than a hobby, I nevertheless felt like I was tapping into some of the pent up hope of generations before me. So often when I see trouble brewing, I cut my losses and move on. But canning reminded me that in the face of an uncertain future, there are things worth preserving – whether a bucket of scandalously red strawberries or a handful of bruised beliefs. Knowing that winters will come, whether the kind that bring snow or the kind that bring a heavy heart, canning embodies the hope that I will be able to meet it when it comes. Hope is a thing with jar lids. Gary Verdict: I had the strawberry basil jam on my waffle a few minutes ago, and it’s the first thing that’s made me consider not using maple syrup all the time. Wash and rinse containers with tight fitting lids. Hull the strawberries. Then crush them using a potato masher. If you like chunkier jam, leave some almost whole berries. You should end up with 2 cups of crushed strawberries and juice. Use only exactly two cups in the recipe.Save the extra for something else- like strawberry shortcake! 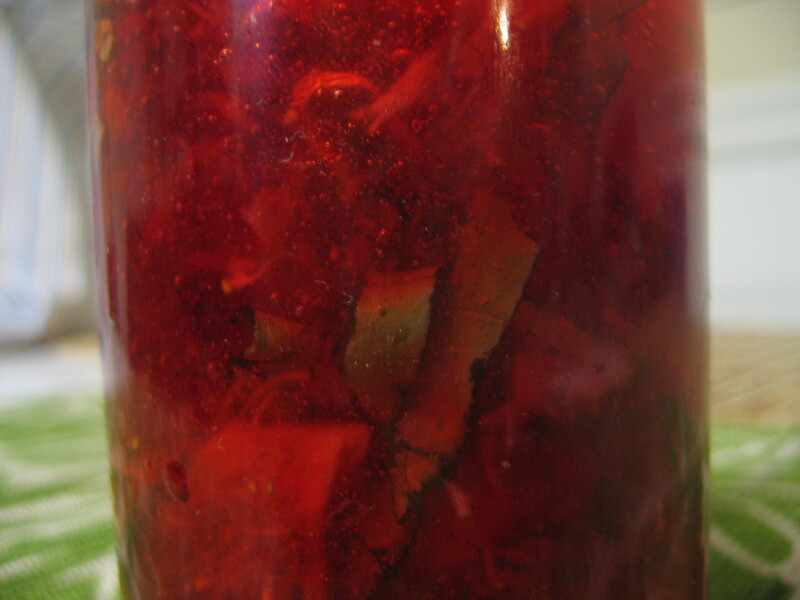 If making Strawberry Basil Jam, chiffonade basil leaves- stack 3-4 leaves and roll lengthwise, then chop stem to tip. It should make little ribbons of basil. 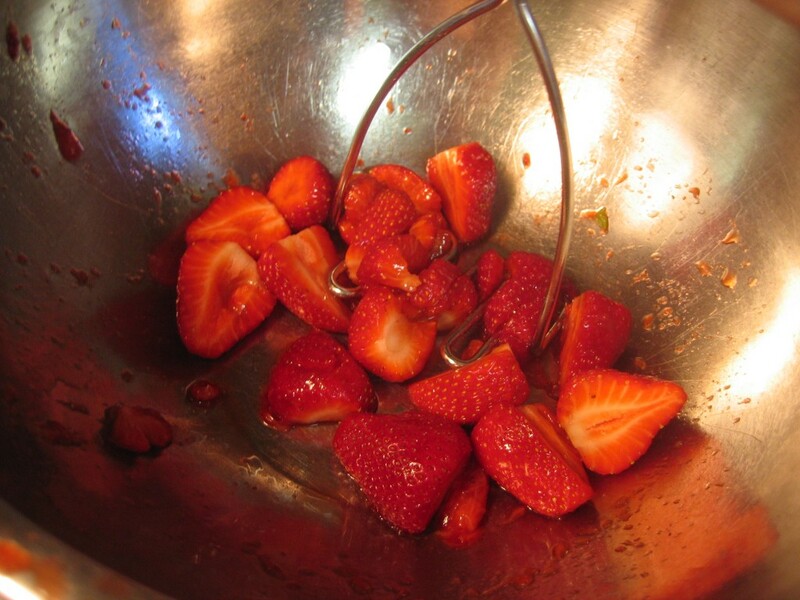 To the strawberries, add the sugar and basil . Mix well. Let the mixture stand for 10 minutes. Meanwhile, bring the water and SureJell to a boil, stirring constantly. Boil for 1 minute, still stirring. Remove from heat. 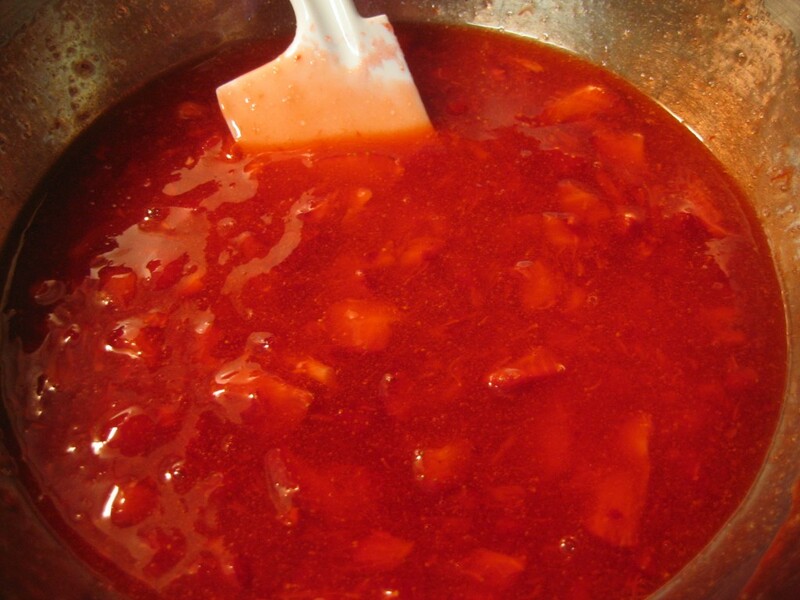 Stir the SureJell mixture into the strawberry mixture. Stir until the sugar is dissolved (when you can’t feel the sugar grains scraping the sides of the bowl)- about 3 minutes.